An unforgettable experience with different activities every day of the week. Our educators look forward to welcoming your children at the French International School Cousteau (former Fromme Elementary building). Faly Soccer Academy (FAS) offers players aged 7 years and up and of all skill levels the opportunity to acquire technical, tactical and strategic concepts necessary to the practice of soccer at a higher level in an environment where having fun is the priority. TIME: 8:00 am to 5:00 pm. For kids from 8 years old and older: We explored several ideas that we will deepen our arts program throughout the week during the morning. You can choose one of the arts and your children will have the opportunity to enjoy it during the all week. The objective of The Faly Academy (F.A.S) Camp is to evaluate and improve physical and motor skills of the participants. During the sessions, all participants have the chance to play different positions, both offensively and defensively. The goal is to help our players understand the responsibilities of the various positions and to become more versatile. Game situations are adapted to facilitate learning, for example, we practice, the 1 vs 1 or 2 vs 2 . Some specific exercises are filmed in order to make video analysis to show the players where they may need to improve and help them make the necessary corrections . 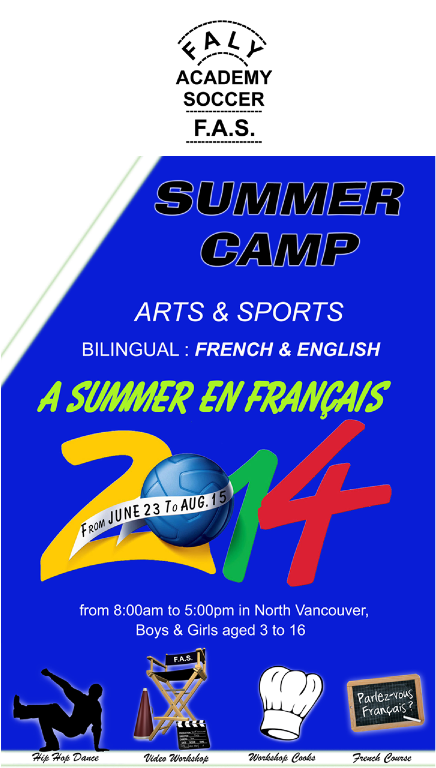 Unlike other summer camps, Faly Academy Soccer (F.A.S) is based on the methodology of European soccer. The director of F.A.S Faly Basse and all coaches are European soccer players with extensive experience in French soccer. From time to time, CPF North Vancouver will post event listings that are relevant to our community and/or promote student involvement in extracurricular activities. We make every effort to to post only accurate information. However, we cannot guarantee that the information posted on its website is always current or correct. For more information about the event or program, please contact its organizers via the email address or the website listed in the post.